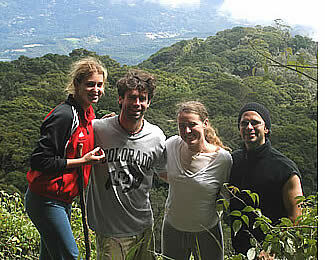 Hike to the Summit of Volcan Baru! The Volcan Baru Camping Trip: Cost and tour itinerary for a guided hike to the Baru Volcano's peak plus camping arrangements near the top to then conquer its summit just before sunrise. 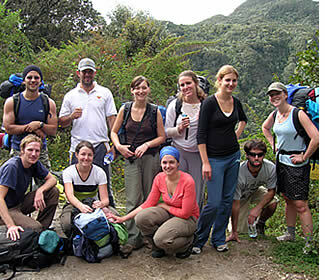 Baru Volcano Trek Guided Tour: Cost and itinerary for a guided excursion to the top of the Volcan Baru. Information and Facts about Volcan Baru: learn more about the Volcano's location, vegetation, animal life & weather that you should expect to encounter. Suggestions, Recommendations and Tips for Hiking the Baru Volcano: What is the best time of the year to make the hike? Will the top be clear enough for good views? At what time should you start? What food, clothing and gear should you take? 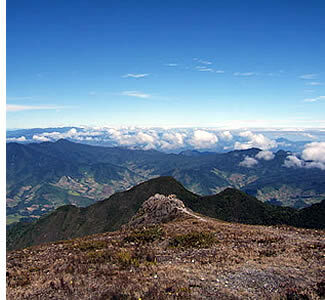 At 3,475 meters (11,400 feet), "el Volcan Baru" is the highest point of Panama. To get the most out of this hike, we invest two days to complete the 27 km to the top of the Baru Volcano and back to Boquete. In this way we are able to have an incredible camping experience, have a rest after the first 13.5 km up and then reach the Volcano's peak just in time to admire how a spectacular sky full of stars (and sometimes a full moon) gives away to a magical sunrise and if we are lucky enough, to the most incredible view of Panama's both coastlines. We meet at a prearranged point to check that all the necessary gear and camping equipment is in place and start getting acquainted with the rest of our fellow hikers who will accompany us for the following 30 hours. Everybody is expected to have had breakfast. A short security briefing is given by our tour guide and then we head out. Previously arranged transportation takes us on a 20 minute drive to where the real adventure begins. We start in the morning of the first day at the ranger station (where we also register by our names and passports, and pay the park fee) at the entrance of "El Parque Nacional Volcan Baru" dressed comfortably to begin the hike with our backpacks full of food, water, extra clothing and with our bodies full of energy. If the group is of less than 6 hikers, then we also need to carry our tents, sleeping bags and stoves. If a large group of Spanish students are going to do the hike we normally hire a driver and rent an ATV (Four Wheel All Terrain Vehicle) with a trailer attached to it to lighten our weight a bit. The ATV will transport all the camping gear (tents, sleeping bags and stoves), as well as extra water. The scenery during the hike changes from rolling grass-covered hills to dense jungle to exposed rocky cliffs. At the 9 km mark, there is a view of one of the craters, which is quite impressive. Extinct for nearly 500 years, the crater is completely covered with growth, as are the crater's walls. Some trails exist on the top, leading to either side of the crater. Other trails to smaller craters also exist, however, we are headed to conquer the Volcano's peak. Timing depends on the amount of hikers and their physical condition. Expect from 4 to 7 hours until we get to the camping site known as "Los Fogones" at kilometer 12 (can vary). Once we are there, we set up our tents, cook dinner and, make a nice camp fire. Some wine is poured around and we make a toast for a clear day and safe return. On full moon nights it is incredible. At just half an hour from the top, after the moon has set, on a clear night, you'll be able to see more stars than you ever have seen before. Next day, normally an hour before the sun rises, we hike the last kilometer and a half to the top. The morning sights are amazing. When the sun starts to rise, beautiful colors of purple, orange, pink and red appear. The sky slowly changes from black to blue while the clouds dissipate and re-form due to the temperature changes caused by the rising sun. This is the best moment to see the oceans. It is hard to put into words how amazing it is to watch this new day begin. 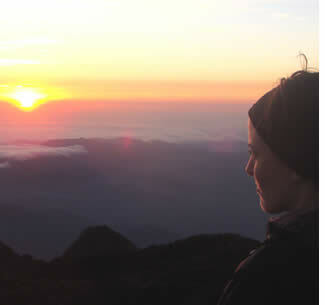 You may have seen sunrises before, but surely few compare to one witnessed at the top of Baru. On a clear day we can easily see the Pacific and Atlantic Ocean. Panama is the only country in the world in which you can do this. After delighting ourselves with the views, the cold normally makes us choose to descend. After taking dismantling the camping site we head back to Boquete. It normally takes 1 hour less to hike back down. The descent is harder on the knees and because of the long hike up, your legs may feel like jelly! Once we're back in town, we exchange emails to make sure everybody can share photos and head to one of the local restaurants in Boquete for a hot meal, some beers, comment on the day's achievements and cheer to a life full of adventure. After this excursion our bodies demand at least 12 hours of sleep, so everybody heads back to rest. 8:30 a.m. Meet at Habla Ya (during the rainy season, we gather an hour earlier). 9:00 a.m. Depart to entrance of the Volcan Baru National Park. 9:20 a.m. Register names and passports at the ranger station. Pay park fees. 9:30 a.m. We start hiking. 3:00 - 5:00 p.m. 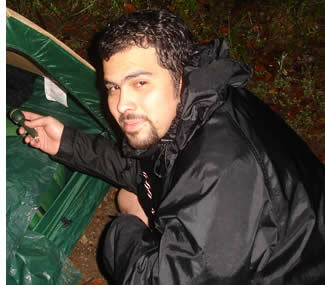 Arrive to "Los Fogones" Camping Site and setup camp (camping site can vary). 6:00 p.m. Start camp fire and begin cooking dinner. 7:30 p.m. Drink some wine, chill out, swap stories and count shooting stars. 5:00 a.m. Wake up and have something small to eat. 5:10 a.m. Start hiking the last part to the top of the Volcano. 5:55 a.m. Reach the top and choose your spot to contemplate heaven on Earth. 7:00 a.m. - 8:00 a.m. Head back to camping site. 8:45 a.m. - 9:45 a.m. Prepare breakfast, get ready to return and rest a little bit. 10:00 a.m. - 11:00 a.m. Start hiking back. 2:00 p.m. - 4:00 p.m. Arrive to ranger station. 2:10 p.m. - 4:10 p.m. Ride back to downtown Boquete. 2:30 p.m. - 4:30 p.m. Arrive at Habla Ya Language Center. Note: schedule is subject to change. 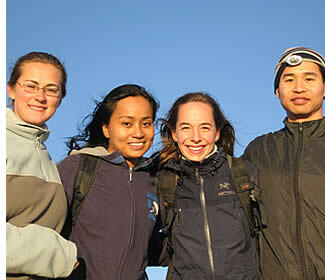 Times are approximate and depend on weather, group size, hikers physical condition and other factors. Prices includes: bilingual certified guide, transportation from downtown Boquete to Baru Volcano National Park entrance and back to Boquete at the end of the hike, entrance fee at ranger station, extra water, sleeping bag, tent, head lamp, pair of gloves, warm hat, sweater, gas canister and portable stove. Lunch, Dinner and Breakfast for the next day are provided, as well as some fruits and snacks. Make your way to the top...Click to collapse. 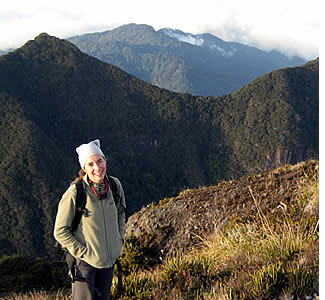 At 3,475meters (11,400 feet), the Baru Volcano is Panama's highest point. The trek to the top of this volcano, without camping halfway through, is an adventure for the fit and reckless only, as the road to the top is anything but a road; it is steep, muddy and relentless. The hike is strenuous but not technically difficult. The portion of the road that departs Boquete is paved, or mostly so, and then changes to a dirt, rocky road at the entrance to the park. Temperatures at the top are very cool, particularly during the dry season months when the cool temperatures are accompanied by high winds. 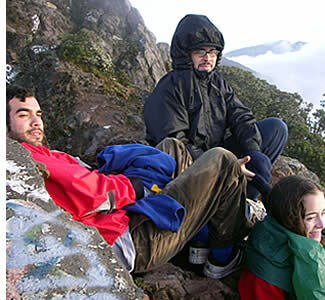 If your days in Boquete are a bit limited or if you just prefer to not do the camping trip, then we can also arrange a 1 day guided hike to reach the top of Baru Volcano. Climbing to the Volcano's peak and then coming back without camping and having a night of proper sleep half way through the trip is only for those who are in really good shape. Expect to be extremely tired at the end of this one day 27 km hike, as you'll be ascending from 1800 meters to 3,475 meters in only 13.5 km and then coming back without recharging your energy. We arrange this excursion to start at 5 a.m. In this way we make sure that we will get to the top before noon and thus it will give us more time up at the top for a clear view. If you would like to be at the top during sunrise we offer a camping option. Some people do not enjoy completing the hike in this way because they arrive at the top totally exhausted and then realize that they've to make the journey all the way back without having a proper rest. Even if there was time to rest, you would not want to because of the cold and lack of equipment (tents and sleeping bags offered in the camping trip). On the other hand you're not necessarily in the best mood to appreciate nature's beauty when fatigue has hit you. 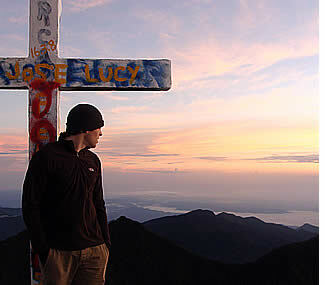 This is why we recommend the camping trip above the two options of just hiking the Volcan Baru. This is a hike to be done on the weekends so you can get your energy back in time for Spanish lessons on Monday. Once at the top, good photographic opportunities exist, particularly during the dry season (from end of November to end of April beginning of May). You can see both oceans from the top on clear days. During the wet season you should usually expect heavy cloud cover, drizzle, or rain. We do not organize this tour to depart at midnight because the the hike would done in total darkness and you'll not be able to appreciate the scenery, wildlife and vegetation at all. To this you also have to add that you'll be hiking when your body will be expecting to be in bed so obviously at 6:30 a.m. when you reach the top and you're supposed to be contemplating the views it shall not come as a surprise that you just want to make your way back as soon as possible (and we take care of our guides... we don't like to ask them to work at these crazy hours). It's also not the safest call: if someone gets injured it's a lot more difficult to take care of the injured when it's dark and get someone up there to help! 30 minutes to reach the Volcan Baru National Park. 5 minutes to register names and passports at the ranger station. Pay park fees. 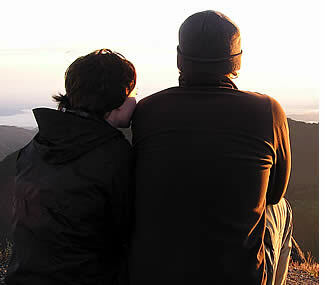 4 - 6 hours to reach the top of the Volcano and choose a spot to contemplate. 1 - 2 hours to contemplate and have breakfast or lunch (depends on the time we leave). 3.5 to 5.5 hours to hike down the Volcano. 30 minutes to drive back to downtown Boquete. At the end of the excursion, 12 hours to rest properly... at least. Prices includes: bilingual certified guide, transportation from downtown Boquete to Baru Volcano National Park entrance and back to Boquete at the end of the hike, entrance fee at ranger station, head lamp, pair of gloves, warm hat and sweater. Two meals, fruit and snacks are provided. This dormant volcano is just south of the Continental Divide in the western province of Chiriqui. The towns of Volcan, Cerro Punta and Guadalupe can be found on its western side, while Boquete is on the eastern flank. The fertile volcanic soil and climate of the area make it one of Panama's most productive agriculture regions as it is also drained by the Chiriqui and Caldera Rivers. The Volcan Baru is roughly equidistant from Panama's northern and southern coastlines, and only about 25 kilometers east of the border with Costa Rica. Due to its altitude and Panama's relatively short width it is possible to see both the Pacific Ocean and Atlantic Ocean (the Caribbean Sea to be more precise) from the Volcan Baru's peak on a clear day. So keep your fingers crossed for an amazing view! Large trees dominate the Baru Volcano's lower slopes, giving way on the upper slopes to smaller plants, bushes, scrub and alpine wildflowers. To learn more about the wildlife that you could encounter read about the Baru Volcano National Park, on the right side of this page. Just before you reach the peak you'll also be able to see how several TV, telephone, internet and radio towers have been setup on its top. The occasional snowfall has been reported on the summit, where the minimal temperature can drop below 0ºC (32ºF). The formation of frost is frequent during the dry season (December to April). 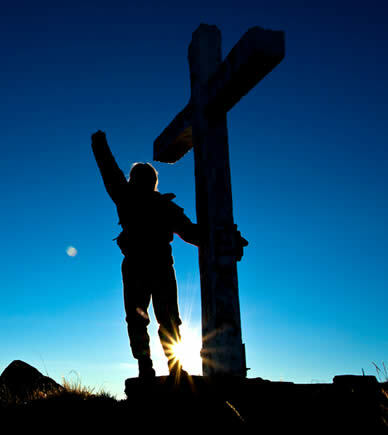 People have died as recently as 1995, due to the fact that they were unprepared once they reached the top. It is better to be safe then sorry, so be sure to take proper equipment and gear, that will allow you to really enjoy this excursion. The Volcano can be hiked all year long but the best time to make the hike is during the dry season from December to April. Before making the hike, observe its peak from the town of Boquete. If it is not cloudy and there are no signs of rain in the area you have a good chance of making it up to the top totally dry and more importantly you'll also be able to have the best view from its summit. But as you'll be ascending from 1,600 meters up to 3,475 meters many things could change. It could rain at some point during the ascension so it is very important to take a good rain jacket, cover all your belongings with a plastic bag inside of your backpack and take at least 2 extra sets of clothing. Even if you do not get wet, you'll definitely want to change your clothing once you're at the camping site or when you have reached the top because you'll have built a decent sweat after several hours of intense hiking and being wet is not very pleasant when it gets cold and you're not moving. Sweaters, jackets, gloves and long pants are highly suggested, if not mandatory. If you plan to spend the night you would be foolish not to bring cold weather gear, a good tent and a below 0ºC (32ºF) sleeping bag. You do not necessarily have to bring this gear to Panama: in our tours all the gear is supplied or you can also rent it if there is no excursion planned during your stay in Boquete. If you're in very good shape and you're going up with a small group, you could make the hike in 4 or 5 hours. If you're climbing up with a larger group or if you're in a moderate physical condition, allow up to 6 or 8 hours to complete the hike. Allow 1 hour less for your journey back down. If you're in poor physical condition do not even try to make the hike. You may consider hiring one of the 4WD trucks that goes up each day to give you a ride but you'll certainly not enjoy the drive up as you'll end up paying $150 for a sore bottom and aching back. The road is anything but a road: it is steep, bumpy, rocky and many 4WD's do not even make it up. They have to have huge tires, special bumpers and other special modifications. Another option is to rent an ATV vehicle for also $150, but then you would be missing the sense of achievement and to tell the truth if you're into 4 wheeling there are many other places better than the Volcan Baru to enjoy some good 4 wheeling adventures. Take plenty of drinking water (at least 4 liters per person), energy bars, chocolates and sufficient food for each meal that you plan to have during the hike. A complete first aid kit should also be taken in case it is needed for any emergency. Also carry your own garbage bags to bring your own litter back. Although you'll find trash cans on your way up they are normally full and the garbage may not be picked up in several weeks. Do not take more than you'll be able to carry for 27 km. Leave any unnecessary weight. When we take groups larger than 6 persons, we hire an ATV vehicle to carry all the camping gear. To make the most out of this 27 km excursion (13.5 km up, 13.5 km down) we recommend camping near the top of the Volcano and then hiking the last kilometer just before sunrise. In this way the journey's effort will be divided and you'll also experience a really nice (and needed) camping experience. If you prefer to hike up and down in just one go, it is also possible and we would suggest that you start to ascend at an appropriate time that will allow you to reach its summit just before dawn. Leaving around or just before midnight should give you enough time, but you'll not be able to enjoy the hike as much as you would during day time, and most people end up totally exhausted if they make the hike without getting some sleep halfway through the trip. Arriving at the top before the sun comes out gives you an amazing opportunity to see how the stars and moon hide just before you witness one of the most spectacular sunrises of your life. On a clear day you'll also be able to see the Pacific Ocean and the Caribbean Sea from the top. Temperatures at the top are very cool, particularly during the dry season months (December to May) when the cool temperatures are accompanied by high winds. Sweaters, jackets, gloves and long pants are highly suggested, if not mandatory. If you plan to spend the night you would be foolish not to bring cold weather gear, a good tent and below 0ºC (32ºF) sleeping bags. In our hiking tours you'll receive all the equipment and gear that you'll need. 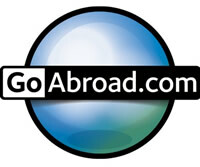 In this way you do not have worry about carrying it through all your travels around Latin American. Before packing, remember to ask yourself, how many times will I use a tent and my sleeping bag? If you plan to use it each week, then its worth taking it through your entire journey, but if you're only going to be using it each month or so, then we would suggest leaving your camping equipment at home. 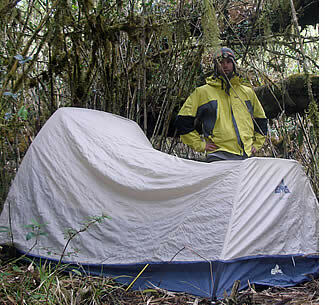 In many places around Latin America you'll be able to rent all the camping gear you could need. Are you tough enough to make it to the top? Play it safe and let us guide the way... Contact us! Is the Volcan Baru an active volcano? Yes. According to the Smithsonian Global Volcanism Program's definition, "active" means having erupted within the last 10,000 years (the "holocene" period). The last major eruption of the volcano was about 500 AD. There are reports and some evidence of a minor eruption about 500 years ago. The Baru Volcano has 7 craters in total. During the hike you'll encounter the largest of these craters and almost at the end of the trail you'll also be able to appreciate the highest one. Large rocks at the beginning of the hike (and even as far as the town of Caldera) help you realize the magnitude of the Volcano's explosions. The Volcan Baru National Park, established in 1976 is located in the western province of Chiriqui near the Talamanca Mountains and is limited by La Amistad International Park and Palo Seco protective forest. It has a total surface of 14,325 hectares (35,000 acres) with an altitude range of 1800 to 3475 meters, which is the highest point of the country and corresponds to the Baru volcano. The National Park features volcanic cliffs, rainforests, cloud forests, highland species and the remains of the last blast of the Baru Volcano. This National Park has a highly valuable geological and ecological system that protects an immense biodiversity. Baru Volcano National Park is part of the Mesoamerican Biological Corridor. Over 400 bird species have been identified, including the resplendent quetzal, commonly elusive but most often seen from January to May. The park is home to abundant wildlife, including the conejo pintado, a raccoon-like animal and other mammals like the endangered underwood water mouse, porcupines and a large number of bat species. All five of the species of cat that are native to Panama are found here, with the Puma being the most common. This park protects ten important rivers such as the Caldera, Chiriqui, David, Platanal, Pedra, Escarrea and Gariche Rivers. The park can be accessed by car through the towns of Boquete (on the west) and Cerro Punta (on the east): from Boquete via a rocky road that leads right to the top and secondly from Cerro Punta, from the Respingo site where the National Authority of the Environment (ANAM) has a refuge and a visitor's center. There are a wide variety of hotels both in Cerro Punta and in Boquete. Trails lead from both towns to the summit of the volcano. The park has an administrative office with an information center, a forest ranger, a natural trail and two ranger stations (Repingue and Alto Chiquero). Worth mentioning about the Park's flora are the endemic species that include the Volcano Junco and the Baru Burbit. Endemic oak trees (Quercus baruensis) are a remnants of the more extensive forests in the geological past. Some of the trees in the forests are more than 600 years old. Other bird species sought by birdwatchers include the spectacular black and white hawk eagle, the black-bellied hummingbird, black-cheeked warbler, different varieties of torcazas, and the Brown Violet-ear. The hairy woodpecker can be seen during the months of April and May. You'll also find endemic species from the Cordillera de Talamanca, like the wrenthrus, the yellow-thighed finch and the black guan. In the Volcan Baru National Park you'll encounter 6 different climate zones: humid mountain forest, low humid mountain forest (only place in Panama where it is found), low humid mountain rainforest, mountain rainforest, very humid low mountain forest and pre-mountain rain forest. Average annual temperatures vary between 20° C at 1800 meters, to under 10°C on the top of the volcano. The rainfall is less heavy on the lower slopes with an annual average of around 4,000 mm and in the highest points over 6,000 mm. Amphibians and reptiles like the iguanas Anolis vociferans and Anolis fungosus have been identified in the Baru cloud forest. The five cat species that live in Panama are also present here, with the puma or leon venado, one of the most numerous. Other endangered mammals include the mouse (Rheomys underwood), the porcupine, and a large number of bat species including Artibeus aztecus and Lisiurus borealis. 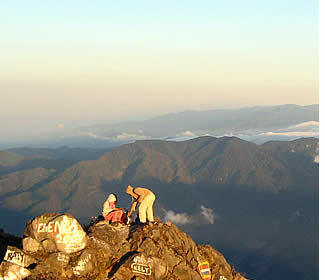 On a clear sunny day both oceans and a good portion of eastern Panama can be seen from the peak of the Baru Volcano. Besides shielding the area's biodiversity, the Volcan Baru National Park also has economical importance because it protects the headwaters that provide irrigation to Panama's most productive agricultural region, concentrated in the fertile areas of the Volcano's skirt. These rivers also attract travelers from all over the world, who come to experience Class III to Class IV rapids in World Class rafting and kayaking trips, providing a significant source of income for hotels, transportation, restaurants and other businesses related to tourism.